Photography is my favorite hobby. I like to shoot Street light, Close up, Landscape and some Business and Investment concept picture. 2,015 stock photos, vectors, and illustrations are available royalty-free. 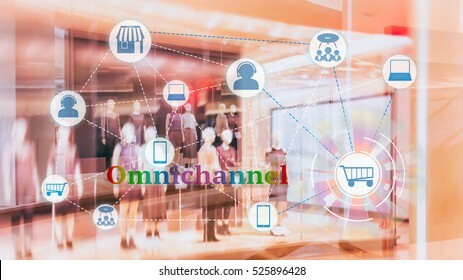 Marketing Data management platform and Omnichannel concept image. 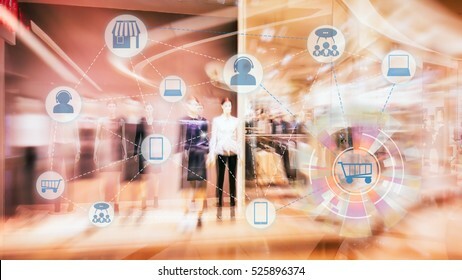 Omnichannel element icons on abstract Fashion store background. Agricultural technology concept. 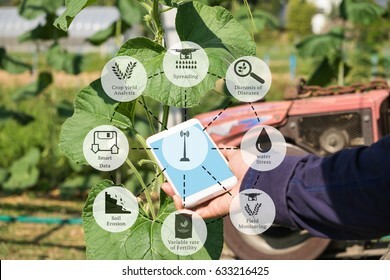 Smart farmer holding smart phone with agritech icons and messages on screen with soil sensor to manage water, soil quality and monitor weather. 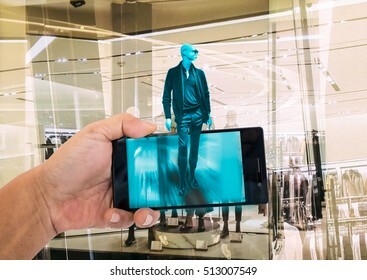 Augmented reality application for retail business concept. Hand holding smart phone with A/R application on screen to finding interested product in the store. 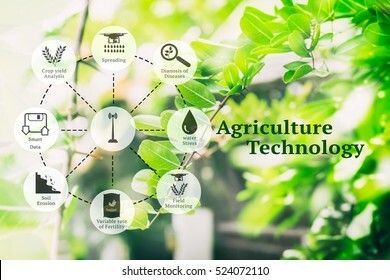 Agricultural technology and organic agriculture concept. 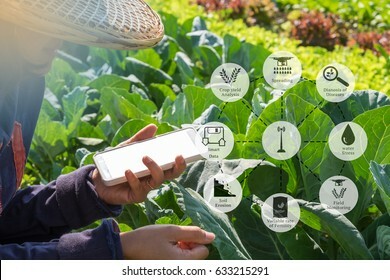 Agritech icons and messages on farmer holding smart phone in vegetable filed. Digital revolution and Internet of Things concept. 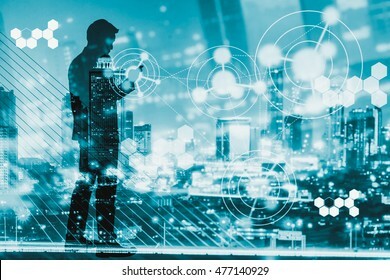 Double exposure of night city light and silhouette of business man standing and using smart phone with futuristic connection icons. 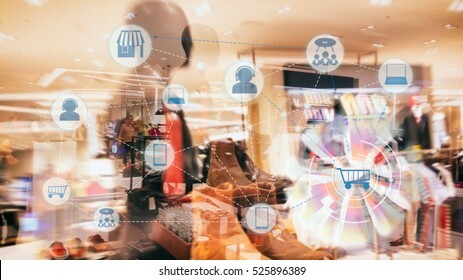 Augmented reality application for retail business concept. 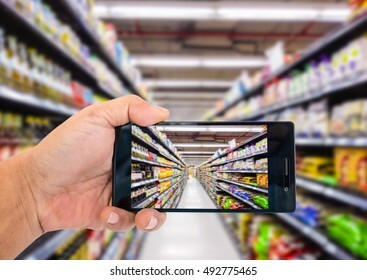 Hand holding smart phone with A/R application on screen to scanning sale alert in supermarket. Represent A/R application in real business. Marketing Data management platform concept image. 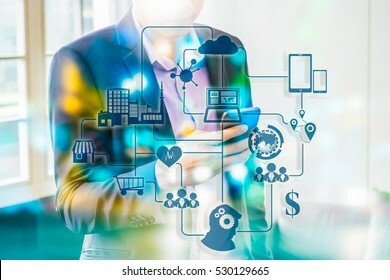 Data collection icons with Big data analytic message on Double exposure of business man using smart phone, bokeh light. 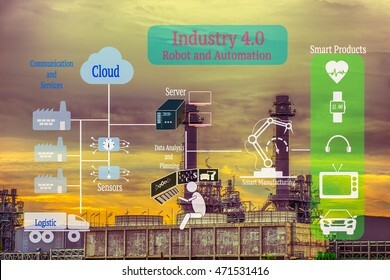 Industry 4.0 concept image. 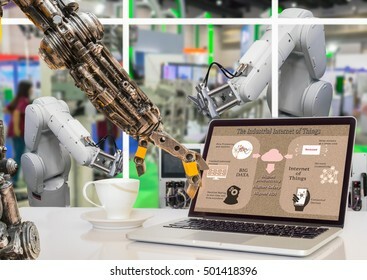 Robot arm point to the Industrial internet of things process diagram on the laptop screen and Robot arm in the factory. Digital business revolution concept. 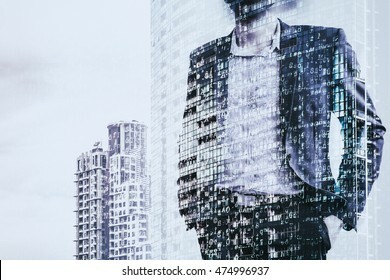 Double exposure of business man standing and abstract digital coding on building. Blue tone. Precision agriculture technology, Application for plants nutrients deficiencies and diseases diagnosis. 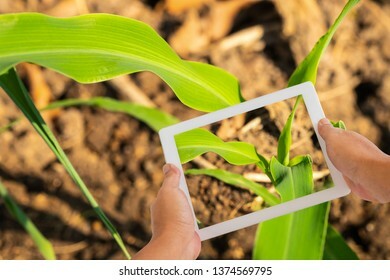 Hand holding tablet with plants picture on screen to checking plant symtoms. Marketing Data management platform concept image. 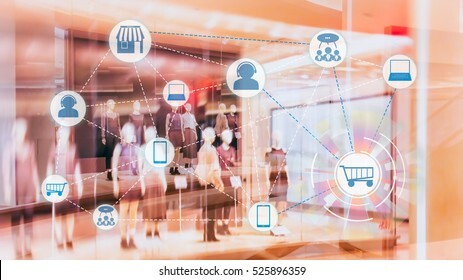 Data collection icons on abstract Fashion stroe background. 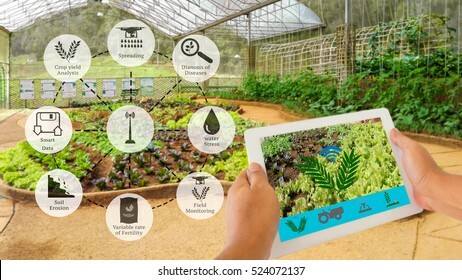 Precision Agriculture and Agritech concept. Precision agriculture network icons on rice field. 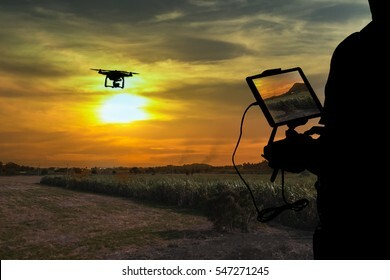 Precision Agriculture and Agritech concept. 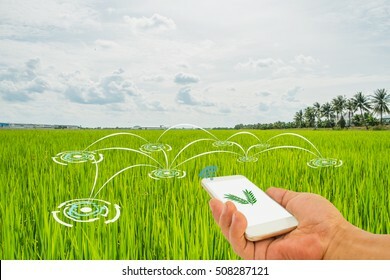 Hand holding smart phone connected with Sensor network in Agriculture technology against agricultural field background. 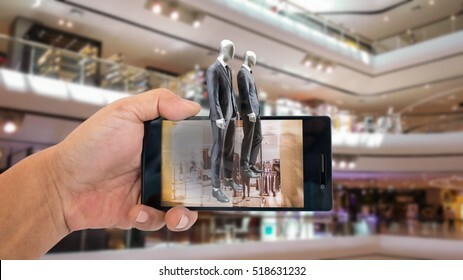 Augmented reality application for retail business concept. 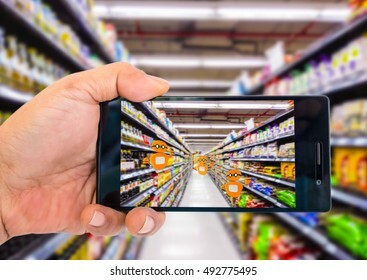 Hand holding smart phone with A/R application on screen to scanning products in supermarket. Represent A/R application in real business. 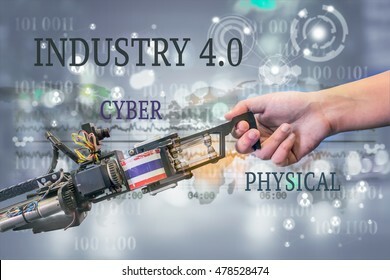 Cyber - Physical production or Industry 4.0 benefit concept. Robot arm is pressing laptop computer with Industry 4.0 diagram on screen against the smart manufacturing workshop. 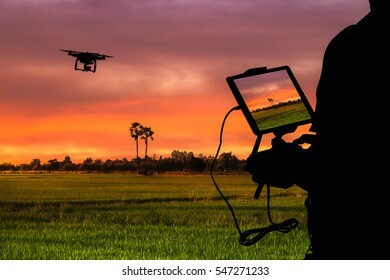 Precision Agriculture and Agritech concept. 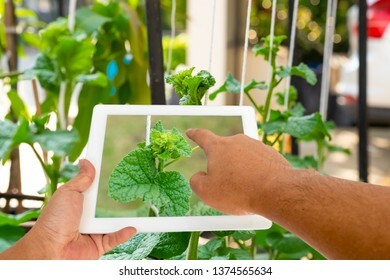 Sensor network in Agriculture technology network on framer using digital tablet to connect the sensor system against vegetable in green house background. 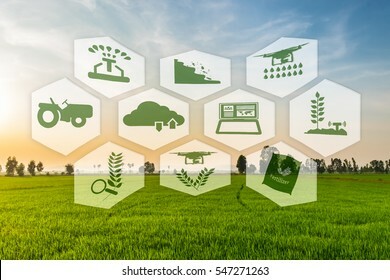 Precision Agriculture and Agritech concept. 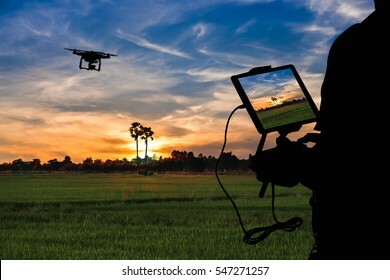 Hand holding digital tablet with Sensor network in Agriculture technologyon screen against agricultural field background. 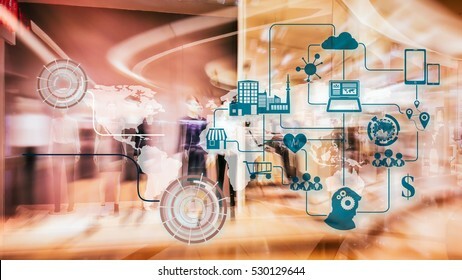 Digital business revolution concept. 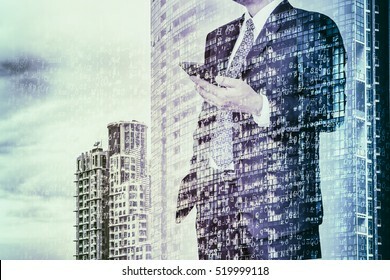 Double exposure of business man using smart phone and abstract digital coding on building. Blue tone. 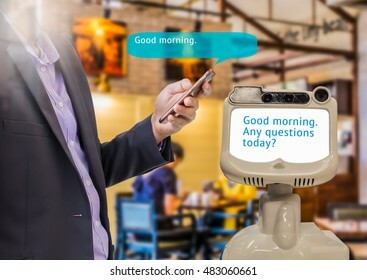 Augmented reality chatbot for retail business concept. 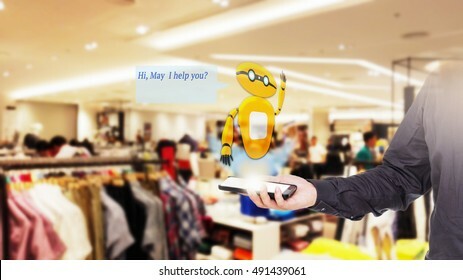 Man holding smart phone with A/R chatbot and greeting message on blur department store background. Marketing Data management platform concept. 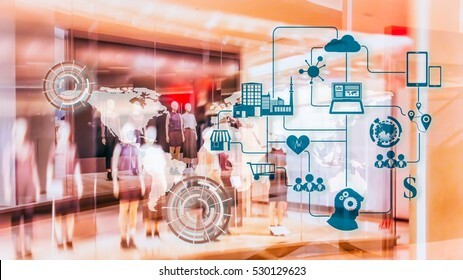 Data collection icons with Big data analytic message on Double exposure of modern department store, silhouette of business man standing using smart phone. Marketing Data management platform and Omnichannel concept image. 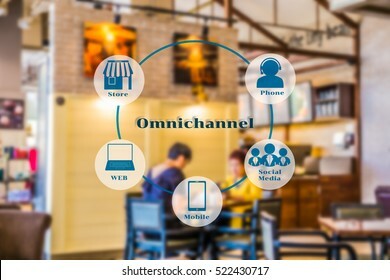 Omnichannel element icons on blur image of two peple siting in the coffee shop background. 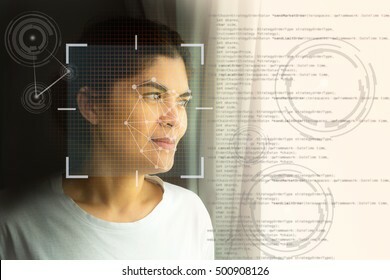 Biometric verification, Face recognition system concept. Female face with lines from a facial recognition software. Augmented reality application for retail business concept. Hand holding smart phone with A/R application on screen to finding shop in department stroe. 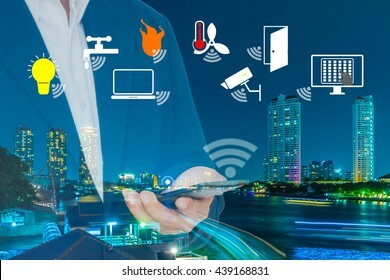 Smart Building and Internet of Things concept. 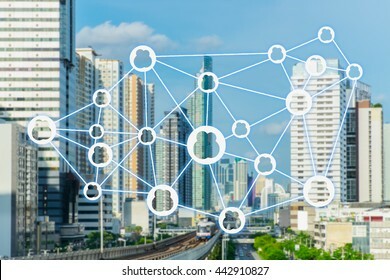 Smart building management icons on Double exposure of office building and abstract digital connection background. ROBO Adviser concept. 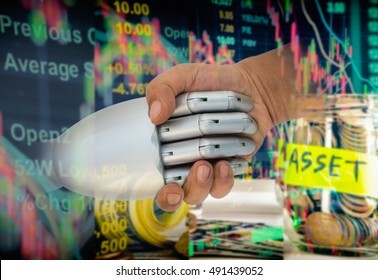 Double exposure of man and robot hand shaking on abstract investment management background. Industry 4.0 concept image. 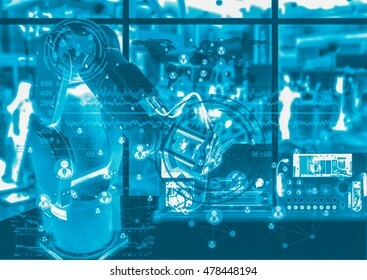 Robot arm and industrial instruments in the factory with cyber and physical system icons. 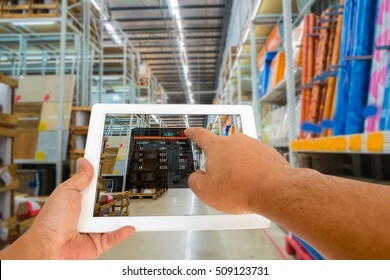 Augmented reality in warehouse and logistic concept. 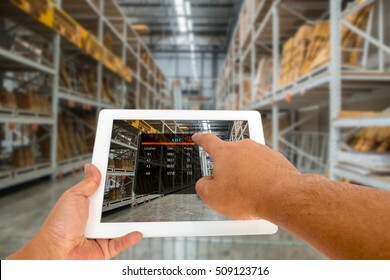 Hand hold and touching digital tablet with smart inventory application on screen in the warehouse. 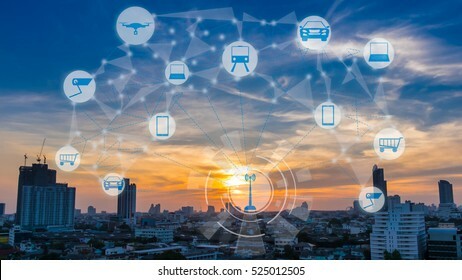 Internet of Things and Smart city concept. 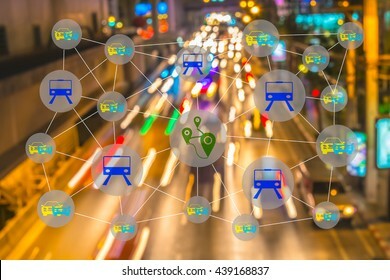 Smart things icons mesh on city traffic at twilight background. Car sharing concept. Sharing economy and collaborative consumption. 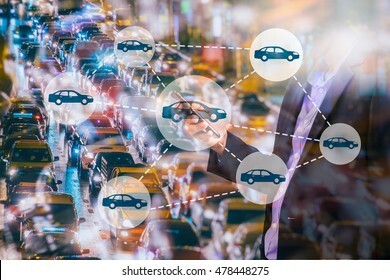 Car sharing icons on Double exposure of Business man using smart phone and city traffic at night. Cool tone. 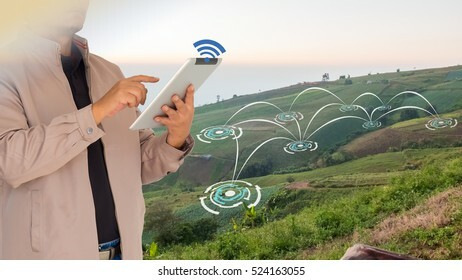 Smart Agriculture and Internet of things in agriculture concept. 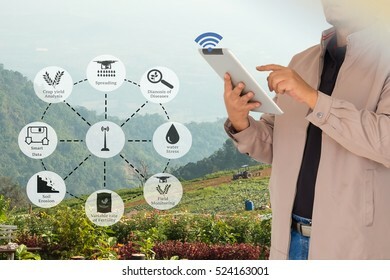 Farmer using digital tablet application to monitor and control conditions from wireless sensor network in vegetables plant. The sharing economy concept. 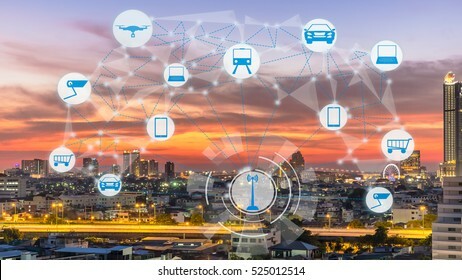 Wireless connection against city infrastructure background. 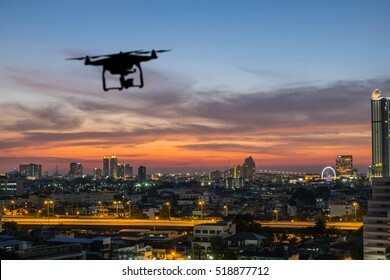 Silhouette of Man using drone to monitor the city at the evening, city sunset background. Mobile payment, Cashless society concept. 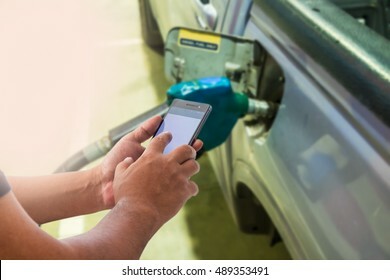 Man using smart phone with blank screen in gas station. 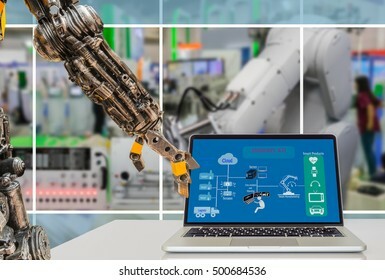 Industry 4.0 and Smart manufacturing concept. Industrial 4.0 process diagram on industrial factory and infrastructure background. 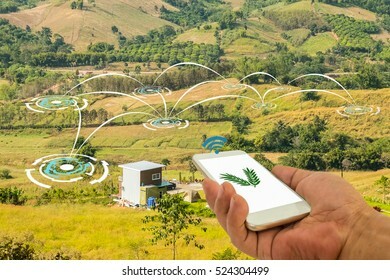 Smart Agriculture and Internet of things in agriculture concept. 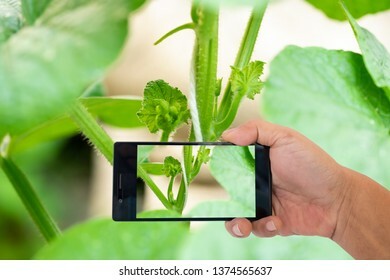 Farmer using smart phone application to monitor and control conditions from wireless sensor network in vegetables plant. 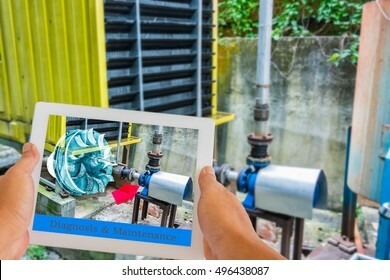 Industry 4.0 and Augmented reality for industry concept. 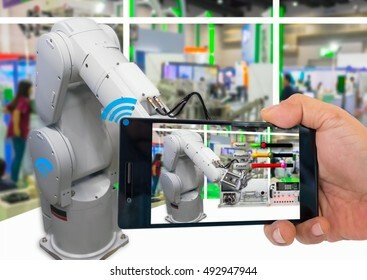 Hand holding smart phone with A/R system control and diagnosis application on automate robot arm in smart manufacturing background. 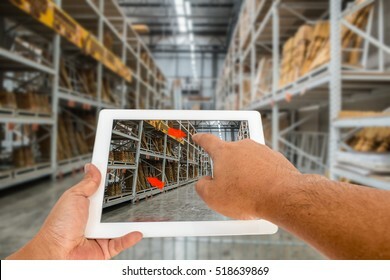 Industry 4.0 and Augmented reality for industry concept. Hand holding tablet with A/R manufacturing system control application on automate machine in smart manufacturing background. 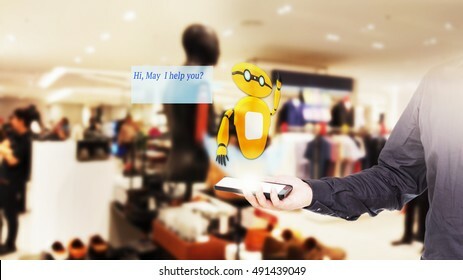 Augmented reality chatbot for retail business concept. 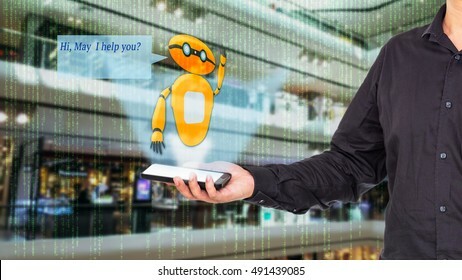 Man holding smart phone with A/R chatbot and greeting message on blur men wear shop background. 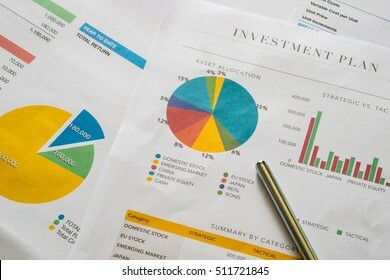 Investment planning and reporting concept. Closed up of investment planning report containing colorful graph of asset allocation planning. Marketing Data management platform and Omnichannel concept image. 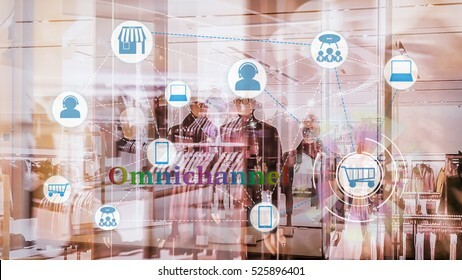 Omnichannel element icons on abstract furniture mart background. 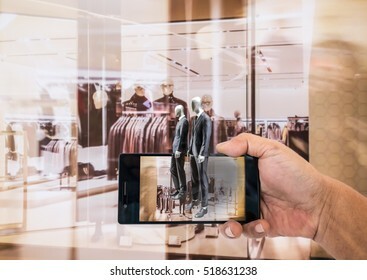 Augmented reality application for retail business concept. 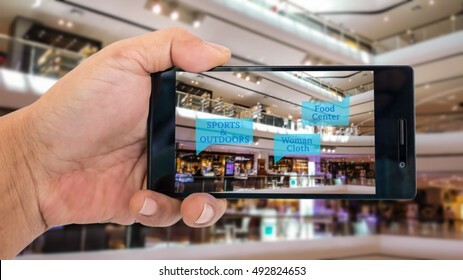 Hand holding smart phone with A/R application on screen to finding shop in department store. Represent A/R application in business. Industry 4.0, Robot and Automation concept. 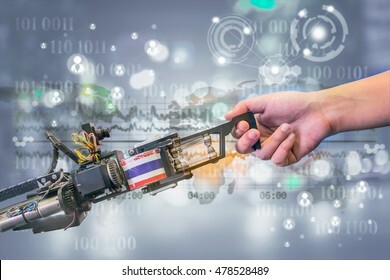 Handshake between a robot and a human on futuristic background. Smart transportation concept. Sharing economy and collaborative consumption. Car , train and GPS icons connected together against abstract city street light background. Chatbot concept. social media mesh and futuristic design on man using smart phone and small robot with message on its screen. Augmented reality application for retail business concept. Hand holding digital tablet with A/R application on screen to finding interested product in construction depot. 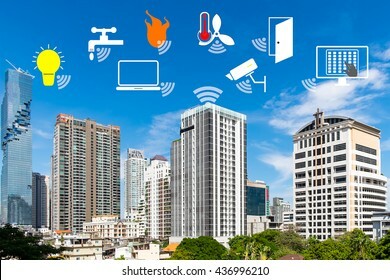 Smart Building and Internet of Things concept. 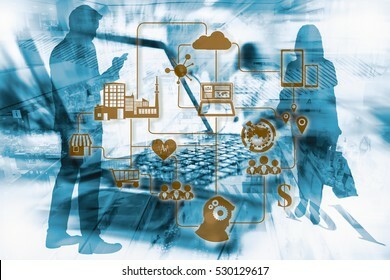 Smart building management icons on Double Exposure image of Businessman use smart phone and City Building at night. FINTECH Concept. 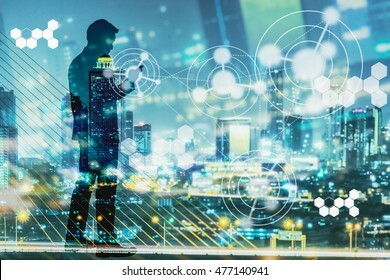 Double exposure of business man using smart phone, bokeh light and FINTECH benefit diagram. 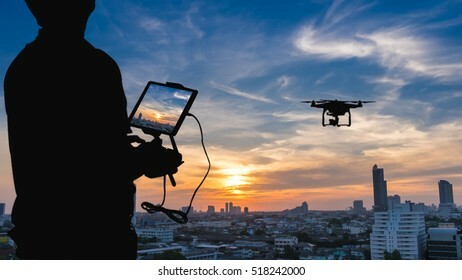 Industry 4.0 and Augmented reality for industry concept. Hand holding tablet with A/R maintenance application to identify machine part repair with refrigeration container in factory background. 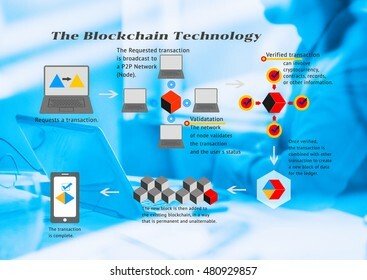 Blockchain technology concept. The blockchain flow chart with detail message on man using laptop computer, blue tone. 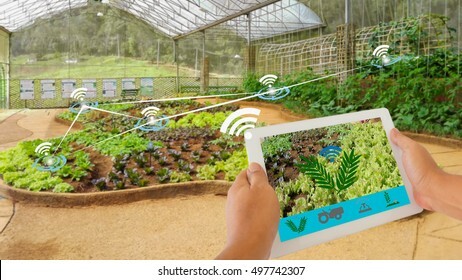 Precision Agriculture and Agritech concept. 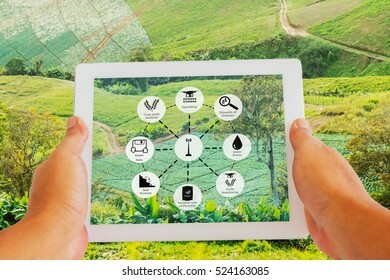 Sensor network in Agriculture technology network on framer using digital tablet to connect the sensor system against agricultural field background. Smart Building and Internet of Things concept. 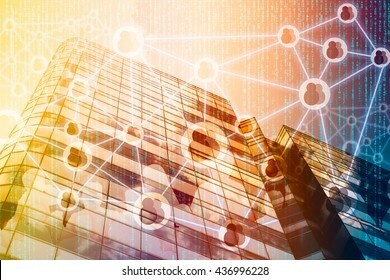 Double exposure of office building and abstract digital connection background. 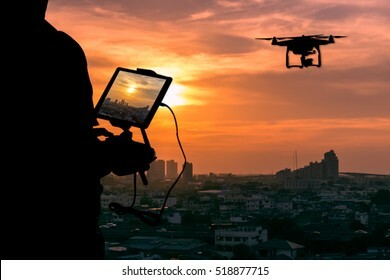 Man playing with the drone. Silhouette against the sunset sky over the city. Agritech concept. Agritech messages and icons on organic vegetables farm. 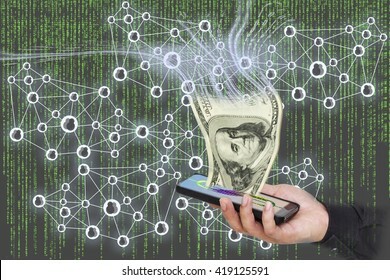 Fintech concept image. 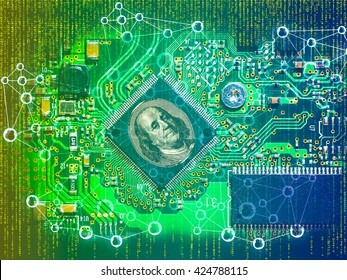 Double exposure of Electronic Circuit, US dollar note and digital abstract code background. 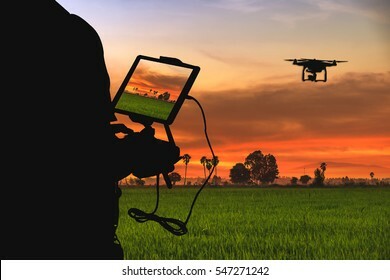 Precision Agriculture and Agritech concept. 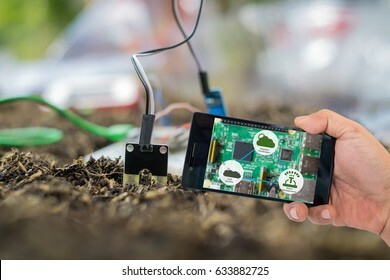 Sensor network in Agriculture technology network on framer using smart phone to connect the sensor system against vegetable field background. 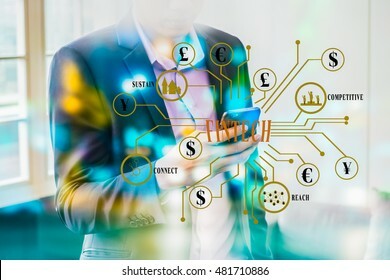 FINTECH concept image. 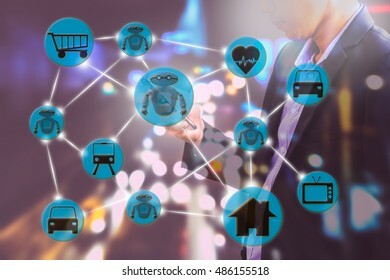 Double exposure of hand holding smart phone Peoples connection icon with digital code abstract background. Representing sharing economy in digital disruption. Marketing Data management platform concept image. 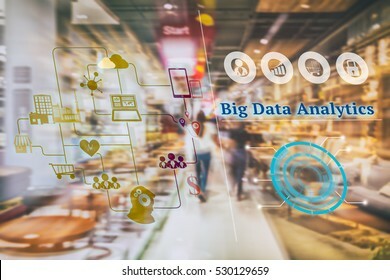 Data collection icons with Big data analytic message on abstract furniture mart background. Chatbot concept. Chatbot mesh on double exposure of Business man using smart phone and bokeh light. 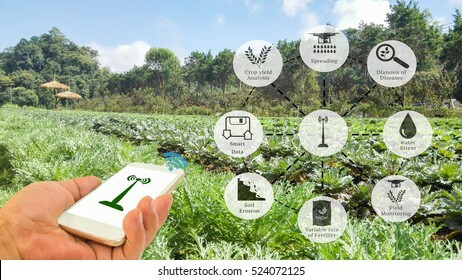 Precision Agriculture and Agritech concept. 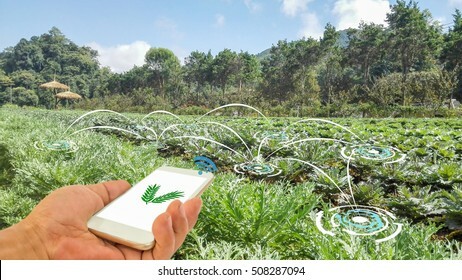 Sensor network in Agriculture technology network on abstract green leaves with message background. FINTECH concept image. 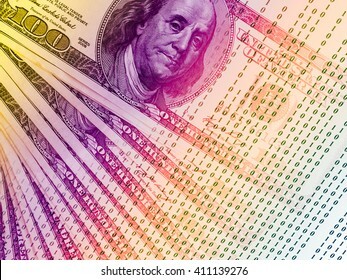 Double exposure of US Dollar banknotes and abstract binary code background, Representing the cryptocurrency or digital money. Industry 4.0, Robot and Automation concept. 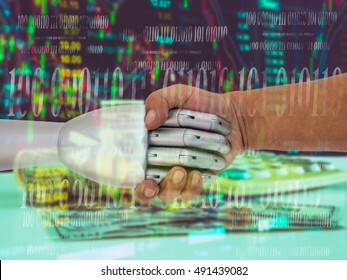 Handshake between a robot and a human on futuristic background and message of cyber - Physical. FINTECH concept image. Digital currencies circuit on abstract og digital and binary code background. 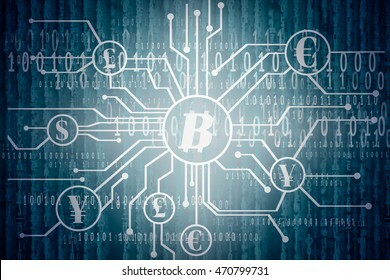 Representing the cryptocurrency or digital money. Mobile payment, Cashless society concept. 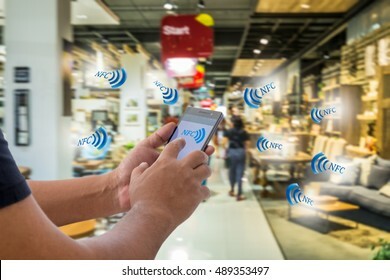 Hand holding smart phone with NFC icon on screen and NFC signals icons against abstract furniture mart background. Agricultural technology concept. 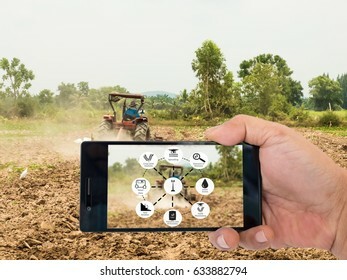 Smart farmer holding smart phone with agritech icons and messages on screen on farmer driving tractor background. Digital disruption concept background. 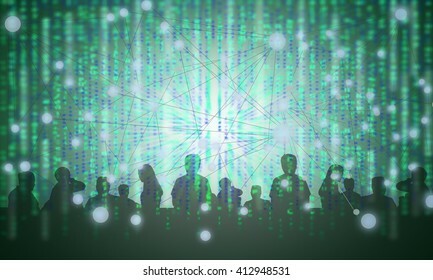 Double exposure of silhouette of peoples with binary code abstract background. Representing sharing economy in digital disruption. 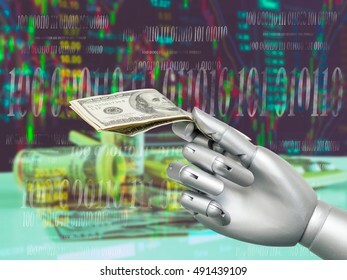 ROBO Adviser concept. Robot hand holding US. dollar banknotes on abstract investment management background. Augmented reality marketing concept. Hand holding smart phone to use A/R application to find product details in retail store. 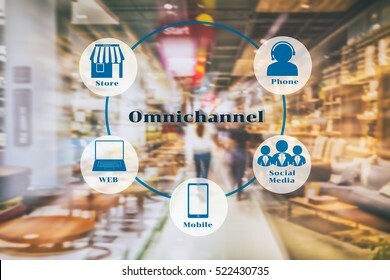 Marketing Data management platform and Omnichannel concept image. 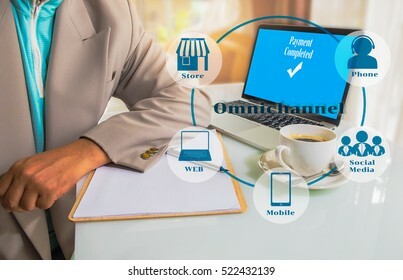 Omnichannel element icons on Business man place his hand on blank paper on the table with laptop computer with payment on screen. P2P Payment concept image. 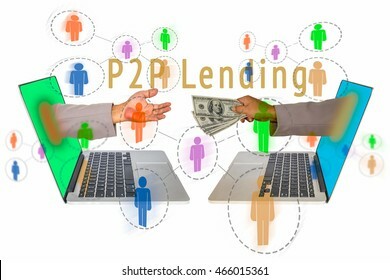 Social network with P2P lending message on side view of laptop with hand coming out from screen for receiving money form the other laptop with hand sending the money. 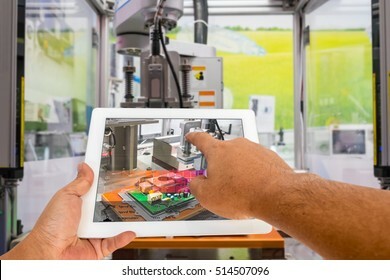 Industry 4.0 and Augmented reality for industry concept. 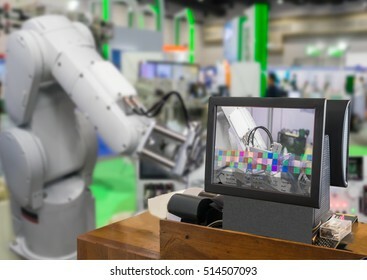 Robotic and Automation system control application on computer screen on automate robot arm in smart manufacturing background. Digital disruption concept background image. 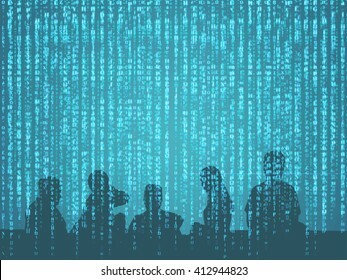 Double exposure of silhouette of peoples with binary code abstract background. Representing sharing economy in digital disruption. Car share concept. Sharing economy and collaborative consumption. 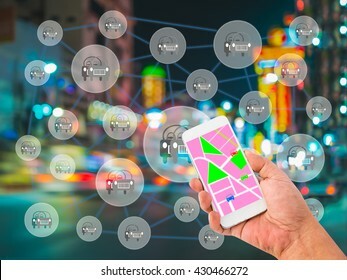 Hand hold smart phone with map application on screen on Car sharing icons and street light background. 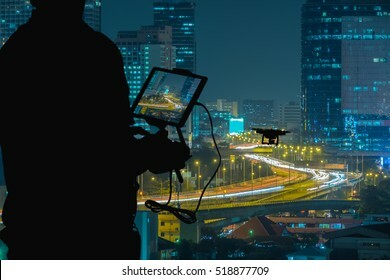 Silhouette of Man using drone to monitor the city night traffic. 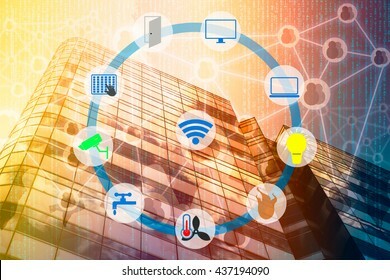 Smart Building and Internet of Things concept. Smart building management icons on Building in the city background.